Leading US party tent and canopy supplier Ace Canopy joins several other companies in Palmdale, California, for a unique giveaway promotion. Many companies try to drum up business by offering discounts and sales. One canopy company is thinking out-of-the-box and putting its money where its mouth is in order to drum up new business and bring the community together. A Los Angeles-based company, Ace Canopy has decided to join several other businesses and giveaway a 4000 party tent. The methodology behind the promotion is you gain strength in numbers. The cross promotional event includes a pizza company, a flower shop, and a graphics design company. The promotion consist of Ace Canopy offering a no strings attached $4000 party tent to be given away at the Ace Canopy retail store on Saturday, July 20. Ace Canopy specializes in outdoor canopies, pop-up tents, carports, party tents and various other types of canopy tents. Ace Canopy sales manager Steve Benson said, “We are very active in the community and thought this was another way to promote our party tent giveaway, as well as collaborate with other companies.” The other companies as well as Ace Canopy will be offering additional discounts on advertisements that range from 15 to 30% off list prices. The large clientele pull in the antelope Valley area will be a launching pad for further promotions at other Ace Canopy retail stores like Los Angeles and Weir Texas. Ace Canopy has several locations in California and in Texas and Palmdale will be part of a test group to see if the promotion will expand. Ace Canopy has held several canopy tent giveaways on its own but never collaborating with other companies. All the companies will promote the event for 3 weeks. 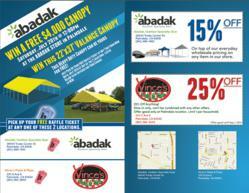 A $4000 party tent will be given away at the ace canopy retail store on Saturday, July 20th. No purchases necessary customer show up, write their name on a ticket and a winning ticket is drawn.